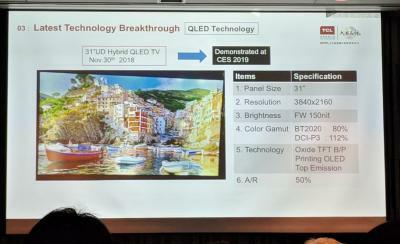 TCL unveiled that the company is developing a new hybrid display technology that uses a blue OLED emitter coupled with red and green QD emitters. All three emitter materials will be combined and printed using ink-jet printing technology. TCL calls this technology H-QLED and this could prove to be the technology of choice for TCL's future high-end emissive TV displays. 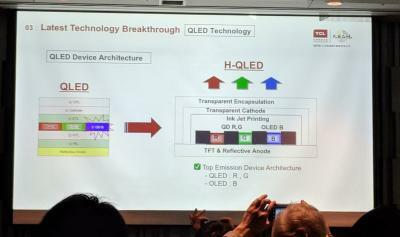 It seems as TCL believes that commercial-level red and green QD emitters will be achievable in the future, but blue QD emission will be more difficult to develop, and hence it will rely on OLED emitters. TCL did not disclose more details - but this R&D effort is being performed at the company's Juhua Printing platform. TCL has been a long-time believed in ink-jet printing technology for OLED TV production, and the company has already unveiled several prototypes of QD-LED displays and ink-jet printed OLED displays. At CES 2019 the company demonstrated a 4K (3840x2160) 31" H-QLED display based on an Oxide-TFT backplane.